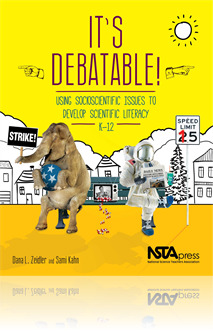 “Functional scientific literacy requires an understanding of the nature of science and the skills necessary to think both scientifically and ethically about everyday issues.” —from the introduction to It’s Debatable! •	Should schools charge a "tax” to discourage kids from eating unhealthy foods? •	Should local governments lower speed limits to reduce traffic fatalities? •	Should pharmaceutical companies be allowed to advertise prescription drugs directly to consumers? At the core of the exploration is the Socioscientific Issues Framework. The framework gives students practice in the research, analysis, and argumentation necessary to grapple with difficult questions and build scientific literacy. After introducing the concept of the framework and explaining how it aligns with the Next Generation Science Standards, the book shows you how to implement it through seven units targeted to the elementary, middle, and high school levels. You even find out how to develop your own socioscientific issues curriculum. Read a sample chapter: A Need for Speed? Should Speed Limits Be Lowered to Reduce Traffic Fatalities?